Anyone even remotely familiar with the North Star community understands the impact that Leb has had on the thousands of people that have passed through the arches. Now he is officially the first person to spend 40 summers at North Star. We're in uncharted territory here! So here's what we came up with... and since Leb doesn't read his "Ramblings," we're in the clear. We want to compile stories and pictures from throughout Leb's years to make him a keepsake of sorts documenting the four decades he's spent on the shores of Spider Lake. We need your help. We're hoping that you'll dig deep in the memory bank to write down that great Leb story from '76 or you'll head up to the attic for the pictures of him with the long, curly hair. We're then going to put it all together to serve as a modern history book. Once you have the material, please email it office@northstarcamp.com. If you have any questions, don't hesitate to email either. 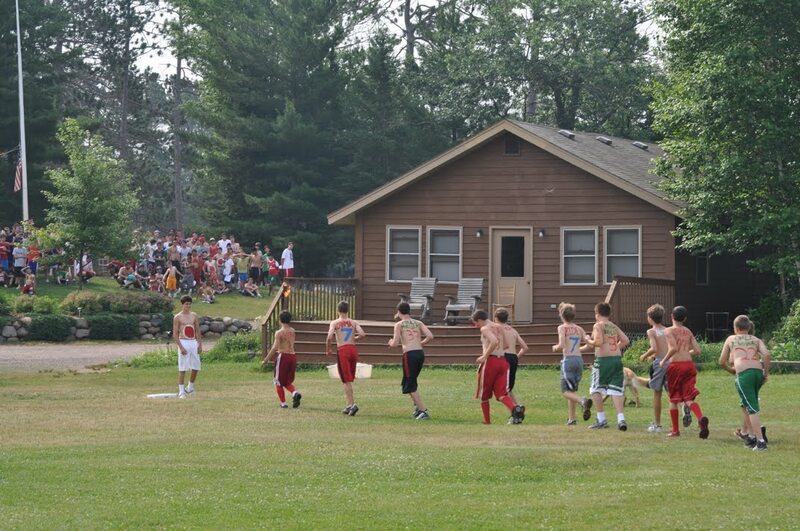 Today was an exciting day as many of our campers traveled to Camp Nebagamon in Lake Nebagamon, Wisconsin. The purpose of their trip was to compete in 8 different events, including tennis, canoeing, sailing, archery, riflery, swimming, chess, and cross country. The teams this year were the Army Knights, Southeastern Oklahoma State Savage Storm, Northern Arizona Lumberjacks and the Blackburn Battling Beavers. Some of the highlights included Nikko dominating arm-wrestling and Brett B. unveiling his hidden talent for cooking. The Beavers emerged victorious and all the participants had a blast! Our trips program is in full swing and over half of the cabins have already embarked on their journeys into the wilderness. We have had trips go out to the Namekagon, St. Croix, Flambeau and Brule Rivers and have more to come. In addition to being able to experience all of the thrills of the wilderness, the cabin trips provide a wonderful group bonding experience. It is really a time where the campers must work together to accomplish the daily tasks of getting down the river, setting up camp and preparing the meals. It's a true test of teamwork that allows the campers and counselors of a cabin to really come together. We love hearing the stories they tell when they return to camp and seeing the pride they take in their accomplishments. While our Senior Village Campers were participating in College Days, our Juniors and Intermediates had some opportunities for bonding themselves. The Junior Village had a campfire where they played Beach Flags,a game where the campers lie down and feathers are placed behind them. One less feather is placed than campers present, and thus, after each round, one camper is eliminated. The goal of the game is to be the final camper standing. 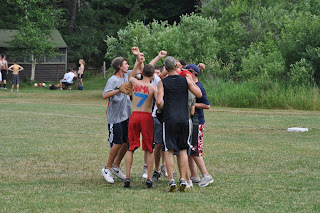 First, each cabin played their own game; next, these winners represented their cabin in the final Junior Village match. The guys learned some camp songs as well and finished with S'mores. The Intermediate Village played Monkey Socks, which is self-explanatory. Just kidding! Monkey Socks is a combination of a trust-walk and a game of dodgeball played with socks. Now it makes sense though, right? It's just another great example of the energy and creativity our staff bring to everything they do to make sure camp is so much fun. Our second session Green-White competition is underway and Village Activities have been fantastic. There have been spirited games of softball, kickball, dodgeball, football, soccer, speedball, tennis baseball and more. Our Green-White Egg Marathon is coming up this weekend and the enthusiasm is very high. This evening our Senior Village had a social with the ladies from Chippewa Ranch Camp. Many of the girls were very excited to see their brothers as well! After a few rounds of speed dating to get everyone acquainted, everyone took to the games including pinatas, fun-bugging and more. One of the best parts though was when the two camps took the opportunity to try to out-cheer one another and display their camp spirit. At those volumes, it is hard to determine which group was louder, but we give both groups an A+ when it comes to taking pride in their camp! North Star a home I never want to leave." "North Star is the key to happiness." We have had a great first week of second session, and there's no better way to demonstrate that than with the words of the campers themselves. Every Friday night we head out to the Council Ring for our Friday Night Service, a values based campfire program. One of the parts of this service is the keylog ceremony, where every camper has the opportunity to throw a stick into the fire and share something he is thankful for. The quotes above are two of the keylogs from this evening's service, and these are just two of the well over 100 keylogs like them that were given tonight. These words were spoken amidst the background of a campfire program about being yourself and helping others. It fit very well after seeing so many young new campers spend the week settling in, making friends and growing comfortable with their home away from home. 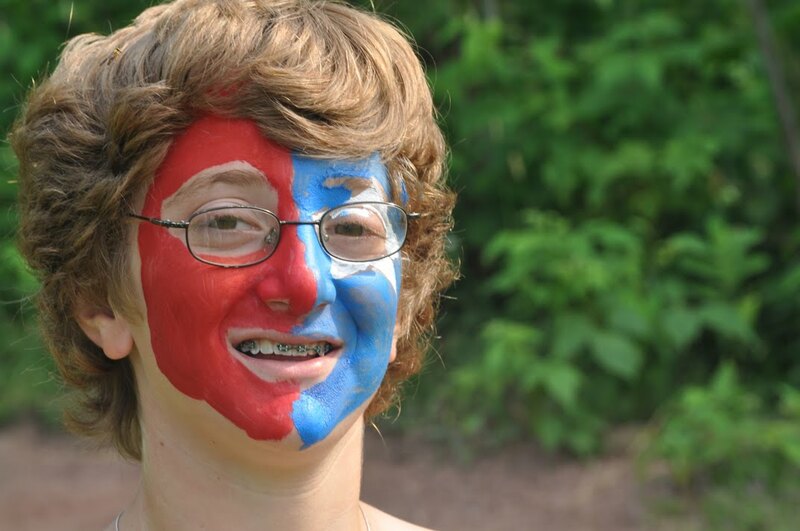 Junior Village Director Andy Rodheim told a wonderful story recalling his first week as a camper when he was homesick, and told us how his counselors refused to give up on him and refused to stop caring no matter how many tears he cried. It was amazing to see as he is now one of our great staff members helping the latest generation of campers make that transition to camp. Andy also spoke of how camp is a place where we can all be simultaneously learning and teaching. By being ourselves, we can teach others many things without ever meaning to, and just by watching we can learn so much. We are less than a week into second session, and one thing we have already learned from this group we could not be more proud of our campers and staff! Yesterday was our first Cruiser Day of second session, and it was a great one. Cruiser Days (typically Wednesdays) are a cabin day where each cabin group puts together their own plan for the day. The day starts with doughnuts and ends with a cookout dinner over a campfire, with lots of fun in between. The cabins can choose from all the activities around camp, and they get creative with more as well. Each cabin takes one Cruiser Day as a Village where they go on a field trip together. Yesterday was the Junior Village Cruiser Day, and it was a great one. The boys headed over to the Hayward waterslide and mini golf for a morning of fun. Camper estimates had the speeds on the waterslide clocked at 120 miles per hour on the “best waterslide ever” – I guess they’ll have to work on math when they get home! From there the boys headed over to the world famous Hayward Lumberjack Bowl for a show and demonstration. 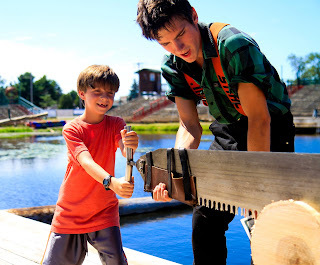 Campers and counselors alike joined in to support their favoirte Lumberjacks with the customary cheer of “Yo – Ho!” The boys watched as the Lumberjacks competed in the underhand chop, the springboard chop, log rolling, boom running, speed climbing, canoe jousting and more. At intermission our mini-Lumberjacks were able to try their hand and the double buck saw with the help of the real Lumberjacks, many of whom will be competing in the Lumberjack World Championships here in Hayward in just a few weeks. Even though they dwarfed our little guys, the boys got right in there and sawed away. After the show, the boys headed to Hayward Beach where they had their cookout dinner. Meanwhile back at camp, the Intermediates and Seniors prepared their dinners at their campfire sites. Last night’s dinner was Tin Foil Surprise, where you take hamburger patties, potatoes and vegetables and wrap it in tin foil and cook it over the fire. The result is a delicious dinner! And s’mores for dessert to top it all off. It was a great Cruiser Day and we’re looking forward to two more fantastic ones. Julian Iannini, a former camper and recent graduate of film school in Los Angeles, has been at camp working hard on our reunion video and producing these personalized videos. This is the last opportunity to be able to catch your son's summer in his very own video. Every camper will still receive the reunion video, and this would be an additional option. If you would like to take advantage of this opportunity, please Contact Us and we will add your son to Julian's list of "future movie stars." Your account will be billed accordingly. Don't wait, as time is of the essence. We are off to a hot start to second session, so it is only fitting that we are in the middle of a heat wave up at camp. We are taking all of the necessary precautions in the heat to make sure that the campers are safe. The boys are required to travel with their water bottles, each period has a water break, and we are being vigilant about sunscreen. Dan has successfully built in extra swims and opportunities to jump in the lake by shortening periods and throwing Beach Parties! But the heat has not slowed us down even a bit. This morning brought the beginning of the regular program. On Sunday night, each camper was given a list of around 100 activities that we offer. They had the difficult task of choosing the six they were going to participate in for the week. They will be doing each of those activities for an hour and fifteen minutes three days in a row. Whether it's archery, climbing, football or waterskiing, the boys have the flexibility to dive into the projects of their choosing. They will then have the opportunity to repeat this selection process each week, which allows them to try new activities and continue with the ones they really loved. With the heat came rain late this afternoon. That moved us inside for our staff show. Our staff has been nothing shy of remarkable with the energy they have brought to every minute of second session, and the staff show on short notice was no exception. We had their creativity and enthusiasm on display with songs, skits, jokes and random talents that had the kids laughing and cheering. Tonight's evening program turned into the greatest game of Bingo ever played. With prizes on the line such as picking the Fun-Bug Dude, Ringing the Bell, or the grand prize of a trip to Dairy Queen, the boys were so excited about Bingo that the Lodge sounded like a sporting event. Ben Mizel's narrations and guessing games made it even more exciting. And when the rain let up, the boys went out to do what boys do - play in the mud! It was a great day on the heels of a great night last night. Dinner was our banquet dinner, which was not only delicious, but the Lodge was filled with enthusiasm and the music of pianist Danny L to accompany all the counselors in silly costumes. After the conclusion of the banquet, we played our first game of All-Camp Capture the Flag, which included the new twist of a Junior Village only flag. We ended the game early and had an evening swim, before the kids went to bed and put a wrap on a great first full day of second session. Second Session - We're off to the Races! The campers have arrived and camp is in session! The buses arrived ahead of schedule to the 95 degree heat, and still found an incredibly enthusiastic and welcoming staff. As we announced the cabin assignments around the flagpole our counseling teams were having dance parties, building human pyramids, and spilling water bottles over their heads. These counselors always make it fun! The campers have unpacked and all of the new campers have gotten tours of camp. The staff are running games so that they can all of the campers can learn each others names. At 6:00pm we had a delicious dinner of hamburgers and fries. The food has been fantastic all summer long! Now each cabin is playing in challenge games with another cabin, which will be followed by our traditional opening candlelight ceremony. The counselors lead a cabin meeting that includes each camper sharing his goals and expectations for the summer. The candlelight ceremony is part of the team-building process at camp, which the counselors continue to develop all summer long. We are so grateful to our staff for the energy they have brought and their commitment to making North Star such a warm and caring place for the campers. The care and attention that they provide for each camper is a big part of what makes this community special. One of our new 10-year-old campers was barely off of the bus for 30 seconds when he said, " I already love it here!" We can guarantee that your kids are going to have a fantastic summer. We are looking forward to an incredible second session of 2011! One of the things that we try to do at camp is to instill the importance of the world community that we work in. We'd like to believe that United Nations Day at North Star is one of the ways we do that, but in reality, UN Day serves as one of the cornerstone special programs of first session. Planning for United Nations Day actually began about about a week ago and culminated yesterday. It started with captains being announced, teams being put together, and then each team practicing over the course of the week the three main series of events. The chief goal of the day is for our campers and staff to display good sportsmanship and have a great time, and while the games can get exciting, this focus remains. The day is split into four main series for campers to participate in, with each series having a wide variety of events, from softball and soccer to table tennis and four square. The day is packed with lots of excitement and as soon as one series of events is over, its time for the next one. Opening ceremonies of UN Day are a great North Star tradition. Once each team has their final cheer, the captains run a torch from the council ring to light the NSC cauldron next to the flagpole. Our UN Day proclamation, written many decades ago by Jack Weiner was read by counselor Ben Mizel and was then signed by the 12 captains. Each UN Day has its own set of highlights...both on and off the field. The morning saw lots of exciting games, from a junior football game that went into double overtime (they used college overtime rules) to a softball game that would be decided by a number of hits tiebreaker. Both curtain ball and four square are always full of excitement as participants implore to referees that there was indeed the proper amount of arc on their throws. After lunch, our staff play a speedball game (a hybrid game that combines elements of soccer, football and basketball). This may be the most important result of the day as the winning team gets to eat dinner first. Our excellent kitchen staff works hard all day to put out quite the spread, with the cornerstone item being deviled eggs. One of the changes we made this year to UN Day was to move our final series, the swim meet to after dinner. This actually happened by accident last year as some late afternoon rain caused us to delay the swim meet, and we realized that it actually ended the day with a lot of excitement as the entire camp went down to swim point after dinner to cheer on their teammates. By the time the day is done, the final scores are pretty immaterial as everyone is ready for bed, however this year there was quite a bit of excitement. The team of Mali was in 4th place when lunch time scores were read, and as is tradition, their cheers ended with the "4th to 1st" exclamation. Well... their cheer was nearly realized. Mali's team members didn't give up and they were able to put on a late afternoon and then a great swimpoint run, and managed to finish the day in 2nd place, just 6 points behind the day's victor, Malta. Reading of the final scores is one of Leb's true enjoyments. While he insists that he doesn't stall, it sure takes him a lot of time to get the final scores. Adding to the stall was one of the better "Big Ten" fakes in quite some time. At North Star we honor our ten year men and women with a roast where guests are present, however the date and time of the Big Ten is always a surprise and we do our best to have a few "fake" Big Ten announcements. In typical style, we'll load up a van with several staff members who get dressed up in costume and create a lot of hoopla. Most of these staff members, however, all thought that it actually was the Big Ten as they were sure that a second van following them was filled with all the Big Ten guests. Unfortunately for them, the van had no guests and they'll all have to continue to guess when the Big Ten will actually be. As expected a great day was had by all... the teams of Japan, Malta, Mali and the United States displayed fantastic sportsmanship along with some great face paint designs. Check out some video highlights from the first two weeks of camp, courtesy of our videographer Julian! Second session campers, you still can be one of Julian's Movie Stars and have a custom video made of your 2011 summer. Read here for more information! As usual, our boys rose to the occasion! With the Fourth of July social being moved from Birch Trail to North Star on very short notice, our guys buckled down and put together a fantastic social. The Friday night storm forced the social from Birch Trail to the shores of Spider Lake, which was the perfect lead-in to our Wizard of Oz theme and our tagline: "We're not at Birch Trail anymore!" The girls arrived in the afternoon to find the Lolly-Pop Guild ready and waiting. Our Junior Village campers opened by serenading the young ladies in their best munchkin voices, before Glenda the good witch lead them along our Yellow Brick Road. Along the way, they ran into the Scarecrow, the Tin Man and the Lion before the real excitement began. On their way up to the Emerald City (Council Ring), the group ran into the Wicked Witch of the West (Sue), who put on an Academy Award Winning Performance in her theatrical debut. But she wasn't alone as our Senior Village Flying Monkeys came cascading out of the woods. Then it was our Intermediate Munchkins who saved the day by dousing the Wicked Witch with water and causing her to melt. They proceeded up to the Emerald City where our cast of characters begged for their respective Brain, Heart, and Courage from the Wizard himself. Leb's voice boomed loudly through the Emerald City telling them all to go on their way before they revealed the true identity of the Wizard - J-1's very own Jack S! He then announced that he would grant all of the Dorothy's their wish to go home, but not until after a great social. And a great social it was! After the skit, everyone went straight into icebreakers and name games to help get to know one another. From there, they were released into an organized free. We had a great picnic dinner with hot dogs and brats, fruit salad and pasta salad, and the traditional red, white and blue bomb pops for dessert. Intermediate Village Director Ben Mizel doubles as a bouncer at the social. The girls took their turn to make a scene as well by preparing an all camp Flash Mob! They pulled it off before we started dinner and they caught everyone by surprise. It was quite impressive. And that was only the start of the dancing. After dinner we had a dance party in Mike Hall. While some danced, others played basketball, ultimate frisbee, or attended a rocket launch out on the athletic field. It was a great night and we look forward to being back at Birch Trail on July 4, 2012. We held our Friday Night Services in Mike Hall as the clouds were looming. About halfway through, the sky turned dark and a storm began that caused a power outage midway through the service. Our reader Ethan H. retrieved a flashlight so that he could continue with the service, and we finished in a unique style for a Friday night. We were on the very edge of the storm and luckily we avoided the worst of it. We lost power for a few hours and some branches around camp. We had two cabins out on their camping trips and our trip leaders handled everything exactly as they were trained to ensure their safety. Thankfully everybody is safe and sound and having a blast. 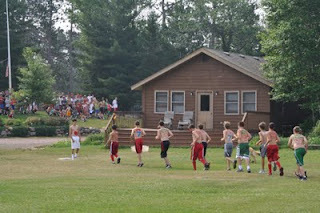 After the conclusion of the service, the Pine Manor campers pulled back into camp after having completed the Canadian. They drove in honking, the trademark of a returning trip, only to find out that they too had to go back to their cabins with the power out and the storm in the area. Leb and Andy went up to their cabins and heard just a few of the great stories that will be telling for a long time to come. But they would not let the storm damper their enthusiasm. They marched up before breakfast on Saturday morning to announce their return back to camp. The storm also caused a change in plans for the 4th of July. Birch Trail was without power for an extended period of time, and during that period, we agreed to host the social. Our guys have been working tirelessly to put together a program with 48 hours notice that will compare to last year's Avatar Social. The guys can't wait for the girls to come, and we can't wait to see what the guys have come up with! On Saturday morning, we hosted the Spider Lake Environmental Education for Kids (SLEEK) gathering at camp. The staff from the Cable Natural History Museum taught many of our campers and some kids from around the lake about our local environment and eco-system. We were proud to host such a great event again. We also had a very successful Rookie Weekend at camp. If you know of anybody that might be interested in our second Rookie Weekend, you can have them check out the website at www.NorthStarCamp.com/Rookie or just give us a call. Sunday night was the always exciting Glen's game, where the campers work tirelessly to get into all four "safe zones" around camp. The difficult part is that the counselors are trying to stop them by pulling their flags. The campers love trying to defeat the counselors in the game and they always go all out for this one. And now it's the 4th of July festivities! Our morning started with sparklers on the pancakes, and a ton of excitement. And we're only just beginning!